Canon has announced a new Wi-Fi and GPS-enabled compact camera in its high-end PowerShot S-series, the S110, revealed at Photokina 2012. The Canon PowerShot S110 features a new 3-inch PureColor II G capacitive touchscreen with Touch AF for easy focusing when shooting stills or videos, and pinching to zoom in on captured images. Wi-Fi connectivity enables you to instantly share photographs online or with other wireless devices, and GPS compatibility enables you to tag photos with your location using your smartphone or tablet's GPS technology, using the free Canon CameraWindow app. The 12.1 megapixel Canon PowerShot S110 features an enhanced Canon HS System, combining a CMOS sensor with a DIGIC 5 processor, to enable you to shoot in varied light conditions and at sensitivities up to ISO 12800. Canon says the ultra-wide 5x optical zoom lens performs well even in low light, thanks to its f/2.0 maximum aperture. ZoomPlus extends the zoom range to a 10x digital zoom. Just as with the Canon EOS 6D, also announced today, you can use your smartphone or tablet's data connection to instantly share photos and videos on social media sites such as Facebook and YouTube, via Canon's CameraWindow app. You can also images straight from the camera when connected to an internet access point, or print them via PictBridge Wireless LAN printers, such as the new Canon SELPHY CP900. Despite its ultra-compact form, the Canon PowerShot S110 also offers full manual controls, a 3-stop ND filter and raw file capture. The lens control ring can be set to manually adjust settings including aperture, shutter speed and zoom. Smart Auto can automatically detect and adjust settings for up to 58 different scenes, and includes Face ID. The Canon PowerShot S110 can shoot Full HD 1080p videos at 24 frames per second, with stereo sound and Fine Detail Movie Processing. Videos can be played on HD TVs via an HDMI connection. 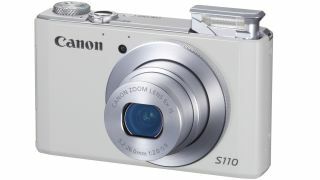 The Canon PowerShot S110 HS has a full price of £429.99/$449.99, and will be available from late October.